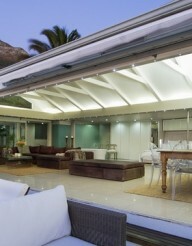 This bungalow is situated on Clifton Fourth beach with views of the sea. The white sandy beach is just 20 steps away. This stylish and modern four bedroom bungalow is fully fitted with all mod-cons and boasts full sea-views from the lounge, dining room and Main bedroom.The bungalow has a plunge pool on the upper deck where one can enjoy a sun downer or al-fresco meal or simply relax and tan. The bungalow compromises four bedrooms all en-suite the main being on the upper floor and the other three bedrooms below. The dining room seats ten and leads out onto the terrace with the plunge pool which has a great view out over the beach. There is also a jacuzzi on the lower floor in a small seating area.